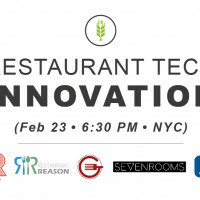 It’s not easy being a food innovator. There’s no road map for reinventing an industry. 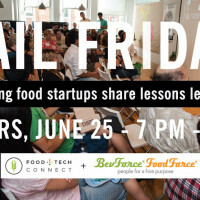 Which is why we’re partnering with Force Brands: FoodForce | BevForce to launch “Fail Friday,” our new event series that will celebrate failure in all its glory. 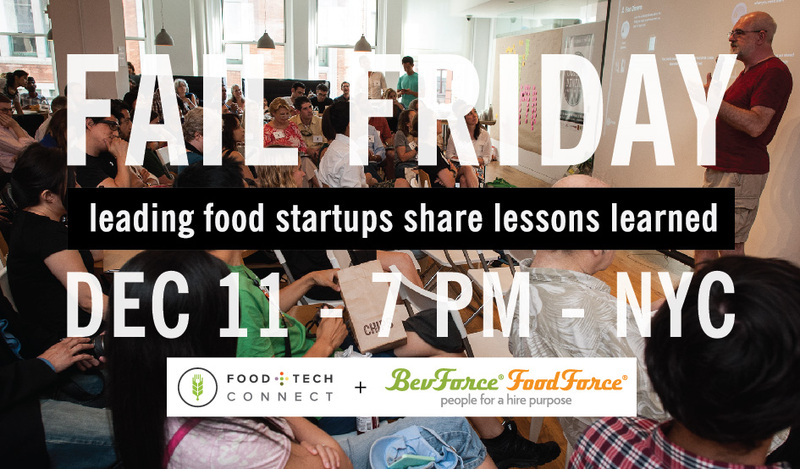 Each month, we’ll invite leading food startups to share their stories of failure and lessons learned from launching and growing their businesses. Our goal is to lower the barriers to success for entrepreneurs by creating a safe space for you to learn from one another and grow together. WHEN: Thursday, December 11 (it’s on a Thursday because holiday scheduling is next to impossible). RSVP: We’re capping the event at 120 people, so make sure to RSVP today. 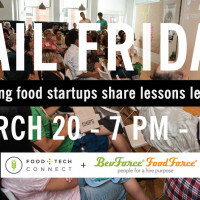 We’re partnering with Farm2Me to bring you nibbles from local food makers, including Bamboo Bites, Cracked Candy and Squish Marshmallows. We’ll also be serving cocktails before and after the speakers share their stories. And there will be lots of time for networking, so don’t forget your business cards. 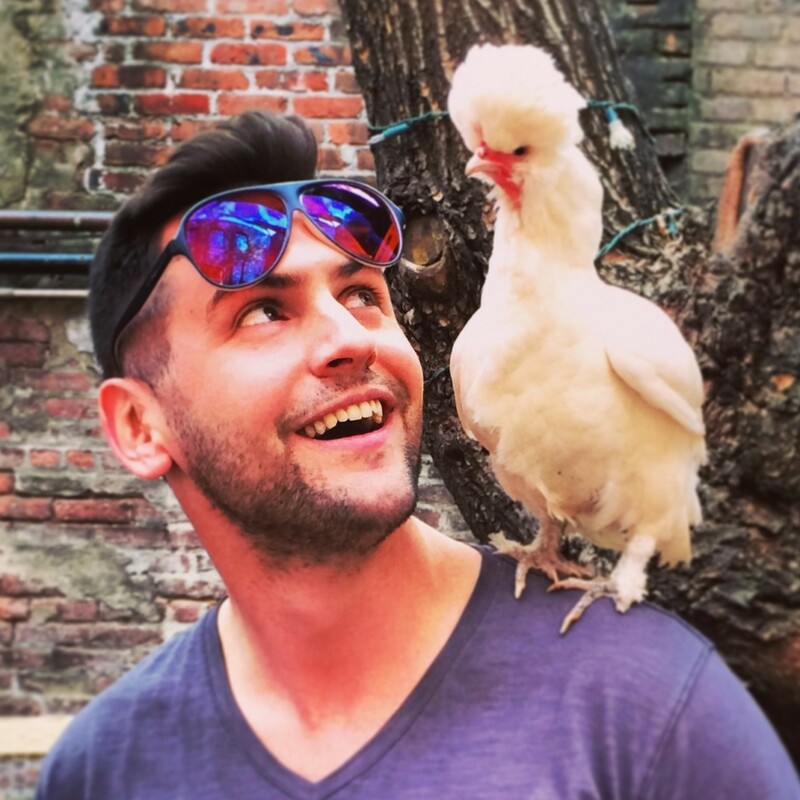 Nick Taranto – Cofounder & Co-CEO, Plated – Nick received his BA at Dartmouth and then moved to Java, Indonesia on a Fulbright grant, where he taught English and started a microfinance group. After Indonesia, he received his MPA and MBA from the Harvard Kennedy School of Government and Harvard Business School. He then commissioned as an infantry officer in the US Marine Corps. After leaving active duty, he worked at Goldman Sachs on a private wealth team managing over $3.5 billion in assets, while serving in the Marine Corps Reserves. In June of 2012, a Harvard Business School buddy and Nick co-founded Plated.com — we are on a mission to use tech and data-driven operations to fix the broken American food supply chain. Over the last year, Plated has raised over $20 million in venture capital and now ships to over 90% of the United States. 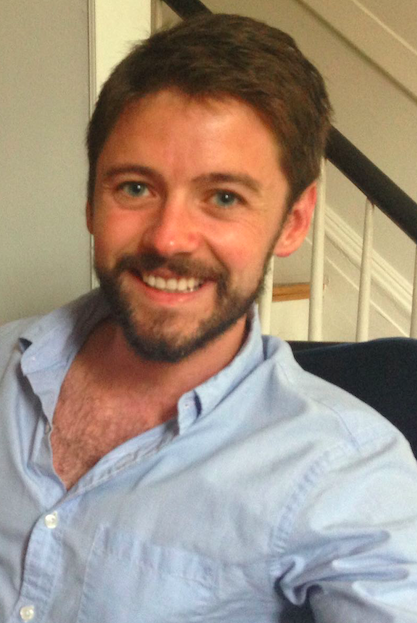 Nick is married, a big fan of peaty whiskey, and contributes regularly to Forbes and the Huffington Post. 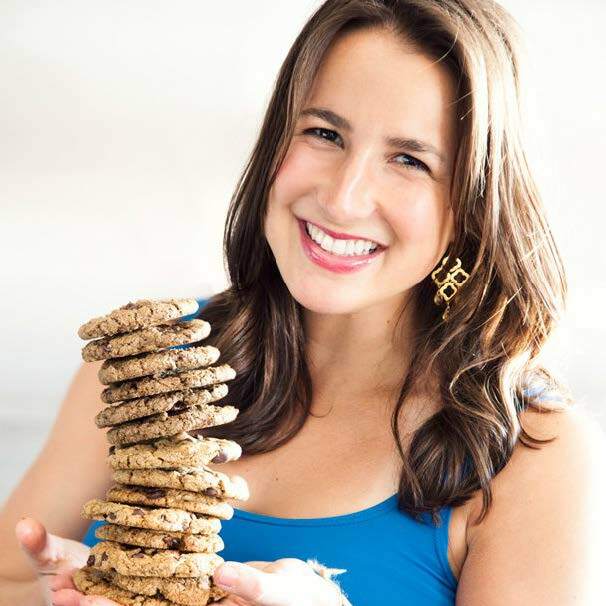 Loren Brill – Founder and SweetEO, Sweet Loren’s – Loren is a New York-based entrepreneur, yogi, foodie, and healthy lifestyle advocate. She is the Founder & SweetEO of Sweet Loren’s, a cookie dough company founded on the promise of real, whole ingredients that are not only delicious, but fuel for the life you want. Loren was voted Top Entrepreneur by Marie Claire, and Sweet Loren’s products have been featured on NBC’s The Today Show, Every Day with Rachael Ray, Vanity Fair, Bloomberg Radio, USA Today, and many more. Loren is a graduate of the Annenberg School of Communication at the University of Southern California and is a certified Hatha Yoga instructor. She completed the master class in cooking at The New School and studied with The Natural Gourmet Institute. Casey Emmett – Director, Strategic Sales – Health Warrior – Casey hails from Williamsburg, Virginia, and has a degree in Religion from Colgate University. He’s spent time hanging from cliffs in the Dolomites and leading horse packing trips in the Teton Wilderness. He has run a marathon, but his sweet spot is between eight and thirteen miles running. 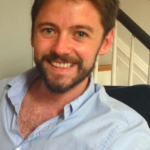 Prior to his recruitm: Casey was a staff field organizer for Barack Obama’s 2008 presidential campaign, and the Director of Marketing for a stem cell research non-profit. Concurrent to selling into Health Warrior’s first accounts in New York City in the summer of 2011, he managed crisis mapping, fundraising, publicity, and logistics for several international NGOs and Coca-Cola. 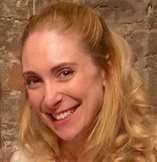 Casey now serves as Health Warrior’s Director of Strategic Sales, based in Brooklyn, NY. Between conversations about Chia Bars he is a runner, reader, writer, drummer, and eater. Crista Freeman – Co-Founder & CEO – Phin & Phebes Ice Cream– Phin & Phebes is a Brooklyn-based company that makes ice cream out of real transparent ingredients in a variety of bold and innovative flavors. Since launching Phin & Phebes in December 2011, Freeman has grown the business from a fledgling, local company into a nationally distributed and celebrated emerging brand. Phin & Phebes Ice Cream can now be found in over 600 stores across thirty US states, and has been recognized as one of the fastest growing premium ice cream brands—a feat Freeman accomplished single-handedly, and for which she earned the nickname “The Closer” for her ability to close ice cream deals both big and small. Crista earned her BFA with Honors from the California College of the Arts in San Francisco and previous to Phin & Phebes worked in eCommerce and design. A self-professed “geek,” when not out earning her nickname she enjoys reading, writing, and painting. She can also be found surfing off the shores of Rockaway Beach or running with her dog (and Phin & Phebes mascot) Fluffnut. 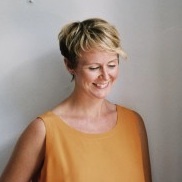 Rebecca Dengrove – CEO and Co-founder, Brewla – Rebecca has extensive experience in the food industry. She hasdeveloped billion dollar brands including Vitaminwater Zeroand Pepsi Max, and authored two publications. Rebecca holdsa Masters in Food Science from Rutgers, and a B.S. in NutritionScience from UC Davis.To prepare for Brewla, Rebecca trained with Dr. Robert Robertsat Penn State on the topic of frozen dessert manufacturing andCharles Bamforth at UC Davis on the subject of brewing.Prior to joining Brewla full-time Rebecca was the Corporate R&D Manager at B&G Foods. 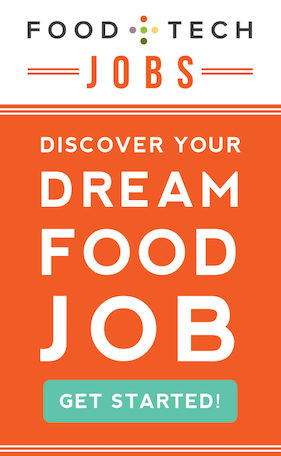 Force Brands: FoodForce | BevForce is a boutique recruiting and staffing agency that specializes in hiring strategies and organizational design for food and beverage companies. A comprehensive hiring and job search platform, FoodForce | BevForce provides the following resources: executive recruiting, contingent staffing, board of director assembly and two specialized industry job boards – one for food at www.foodforce.com and one for beverage at www.bevforce.com. With headquarters in New York, NY and an additional office in Los Angeles, California, Force Brands finds and places food and beverage professionals nationwide in sales, marketing, finance, operations, production, supply chain, human resources and technology roles. Coming Winter 2014! Farm2.Me is a Farm-to-Fridge and Farm-to-Wholesale Online Marketplace. 100% hand-selected Organic, Raw, Vegan, Gluten Free and Local food makers + farms sourced, prepared and delivered.